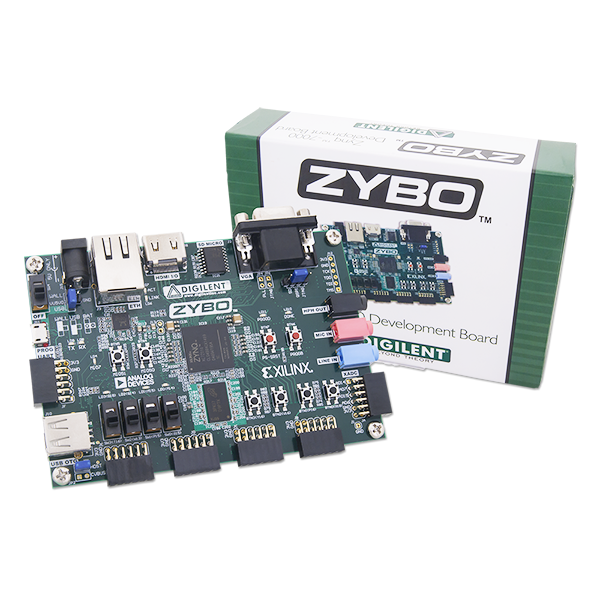 Today we are excited to announce an update to our popular Zybo board, the Zybo Z7! 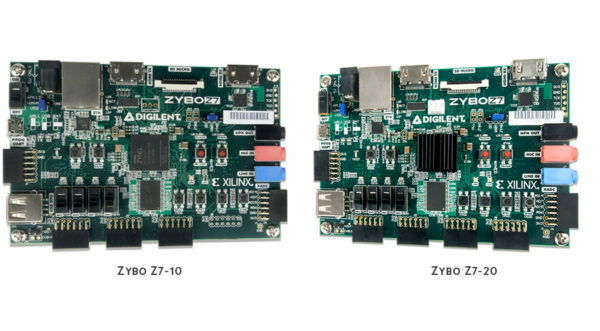 Originally released in late 2012, the Zybo featured the Zynq 7010 APSoC from Xilinx, a combination FPGA and Dual Core ARM Cortex A9. 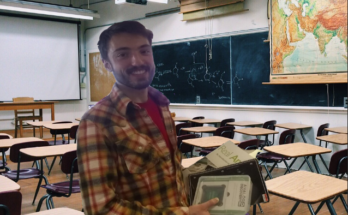 Since then, the Zybo has found it’s way into classrooms world wide and onto thousands of work benches. 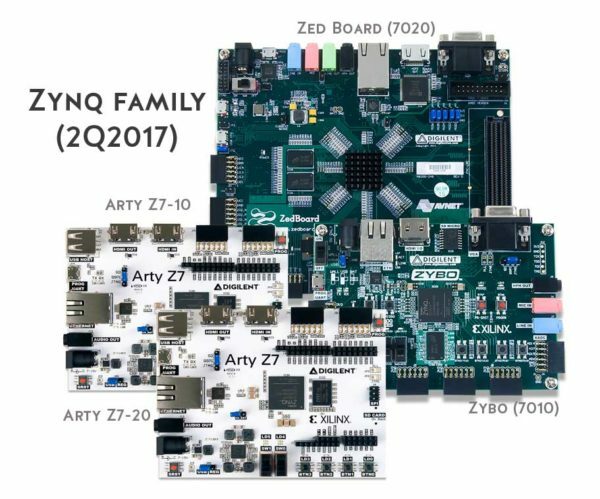 In the past year, we’ve been releasing new Zynq based products (like the Arty Z7-10 and Arty Z7-20) and it became apparent that the Zybo was overdue for an update. So, we got to work on the designing the Zybo Z7! This board keeps the things that we most loved about the Zybo, but offers several improvements to help keep the Zybo namesake current. Let’s take a look at some of these. 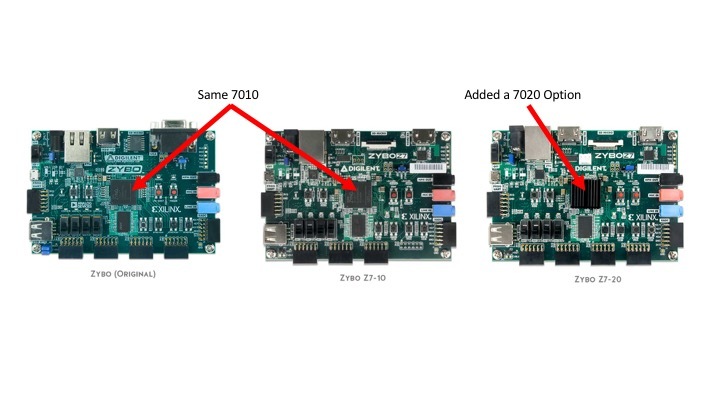 The first is that the Zybo Z7 now comes in two options, a 7010 and a 7020 version. 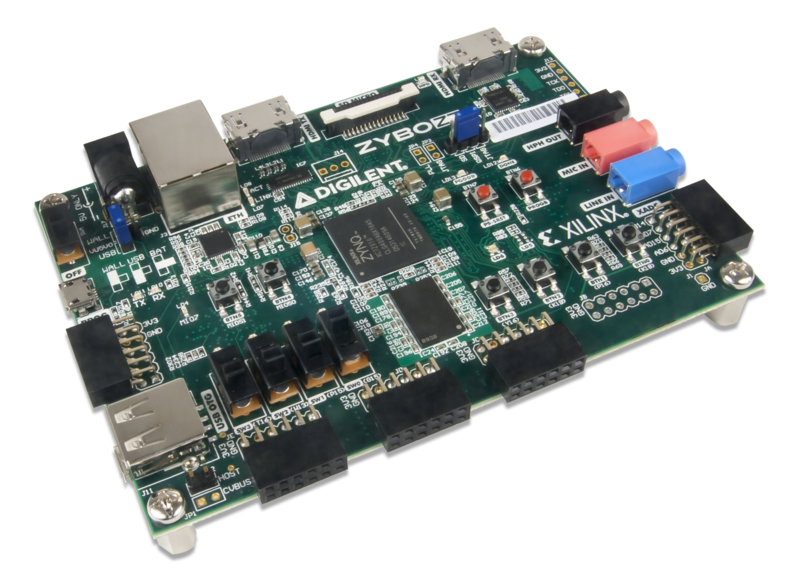 The 7010 version is the exact same Zynq chip that was on the Zybo, but doubles the DRAM from 512MB to 1GB and uses DDR3 memory for lower power consumption. 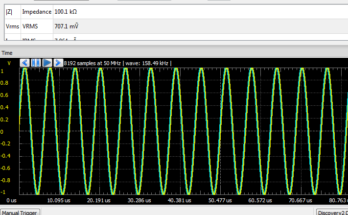 There has also been a minor improvement on processor speed from 650 MHz, to 667 MHz. The 7020 version has the same improvements, but has an increase of 3 times the look up tables, flipflops, block RAM and double the clock management tiles. 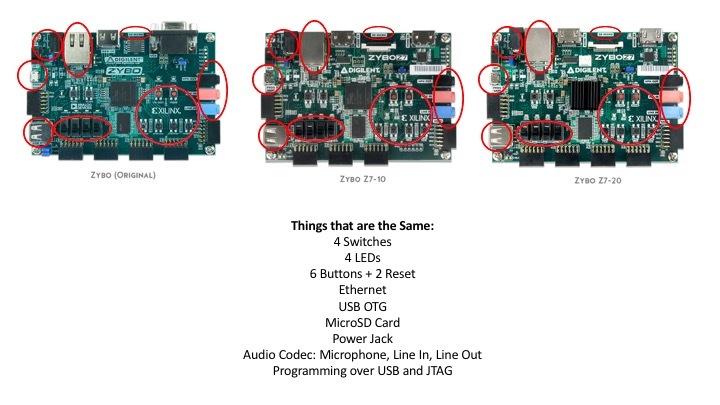 The Zybo Z7 still has on board programming, with a bypass header (if you need to use your own JTAG programmer), USB OTG, Ethernet, MicroSD Card, configurable power from USB, or external sources and audio including headphone out, microphone and line in. These were all peripherals on the original Zybo, and there were no changes. There are still 4 Switches, 6 buttons, 2 reset buttons and 4 LEDs, like with the original Zybo. 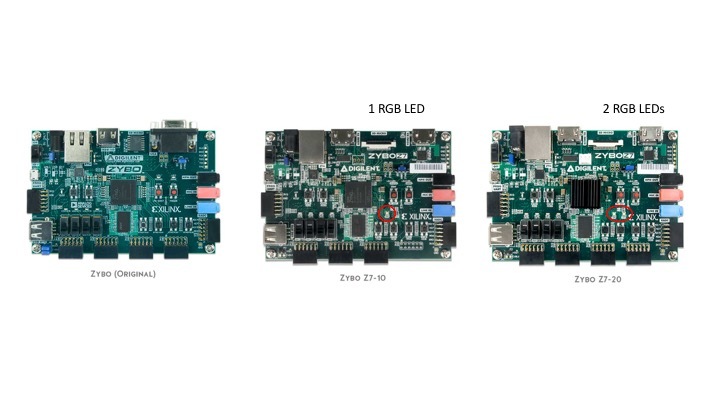 Our first change is we’ve added RGB LED’s on the Zybo Z7, there is one on the 7010 and two on the 7020. Another change is the HDMI and VGA. 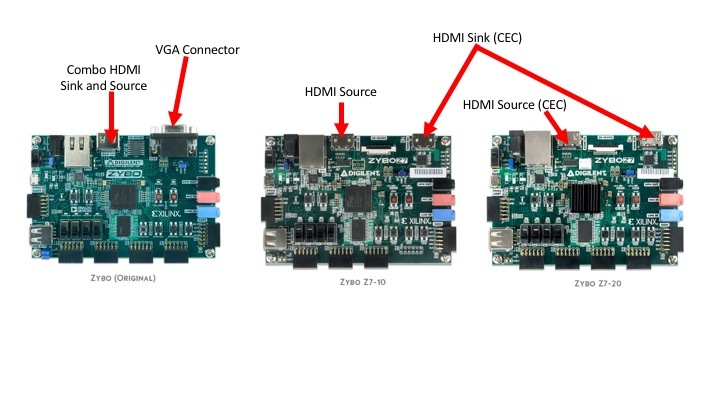 The original Zybo had single HDMI sink and source port with a unique configuration to choose which mode the HDMI was in. This was a creative solution at the time of release to allow users to have access to both VGA and HDMI options. Since then, we have received feedback that users prefer having dedicated HDMI in and HDMI out Ports. So on the Zybo Z7, we have removed the VGA connector and replaced it with dedicated ports. 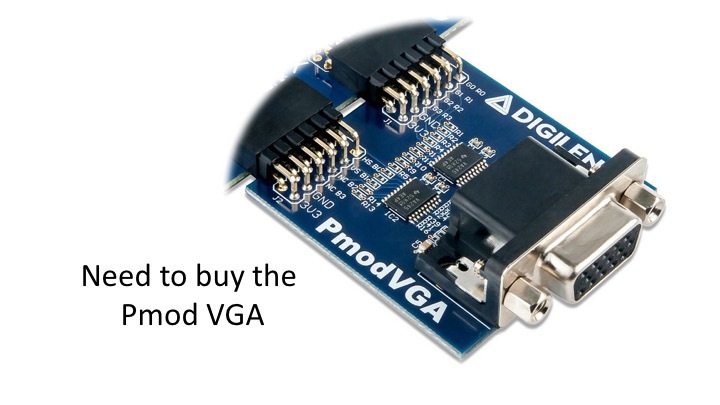 Users that still need VGA support can purchase the recently released Pmod™ VGA. On the original Zybo, there were 6 Pmod connectors. This is the same for the Zybo Z7-20, however, for the Zybo Z7-10, there are only 5 Pmod connectors. We’ve left that Pmod connector as unloaded. The Zybo Z7-10 did not have enough signals to route to both a Pmod connector and support the most substantial update to the Zybo, the Pcam Connector. 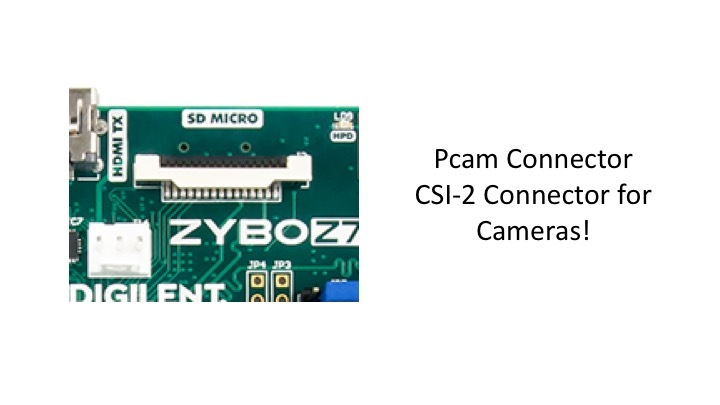 The Pcam connector is a MIPI- CSI2, or MIPI- Camera Serial Interface is a standard connector that supports a wide range of high speed video options such as 1080P, 4K and high resolution photography. 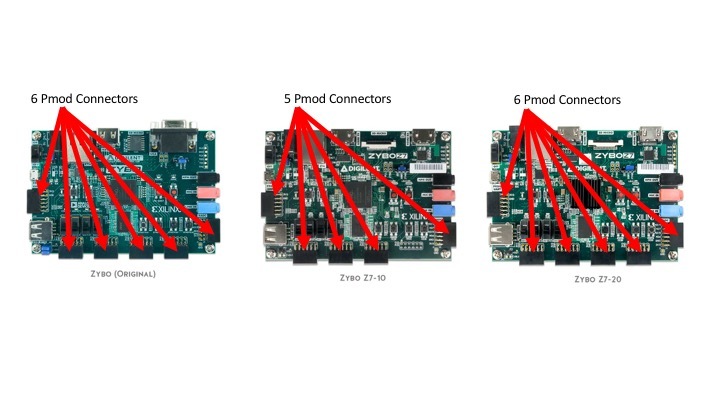 You can use a wide range of camera options, such as a Raspberry Pi Camera or the Digilent Pcam modules that will be released later in the year. For those customers that are using the Zybo in courses, there may be concern about migrating from the original Zybo to one of the Zybo Z7 options. To help make this transition smoother, we created a migration guide that you will be able to access on the resource center. We are excited about this refresh of the Zybo product line and think you will be to. 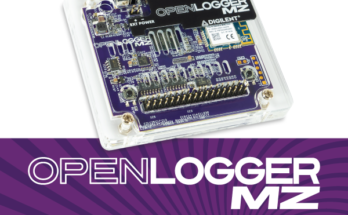 Let us know what you think and make sure to check it out at the Digilent Store!